While in Seattle last week, I had the opportunity to check out two of Tom Douglas's restaurants. Etta's and Serious Pie. If I had more time in the city, I would have made it a mission to visit every one of his 13 restaurants throughout Seattle. Tom Douglas is a fantastic Chef with more James Beard nom's than your eyes would believe. He is also an entrepreneur, selling his world famous Rub with Love all through Seattle and online. My Mother actually introduced me to Salmon Rub with Love years ago so I already knew what to expect. One of the three flavors of Rub with Love that I purchased was Tom Douglas Spicy Tokyo Rub. I cook a lot of seared tuna at home and the Spicy Tokoyo Rub was the perfect option for this 5 minute meal. This was incredibly delicious and easy and took less than 5 minutes to cook. I served the tuna over Asian style green beans which I sauteed in garlic, sesame oil and soy sauce. Pat spice rub evenly on all the tuna chunks. Heat the oil in a non-stick skillet (note: I use my cast iron skillet when preparing seared tuna) over medium high heat. Add the tuna and sear on all sides, 2 minutes each side. The tuna is still raw or medium rare in the center. Remove the tuna from the heat and thinly slice. If you're wondering what is in the Tom Douglas Spicy Tokyo Rub : Red Pepper, salt, sesame seed, smoked paprika, coriander, natural lemon juice powder, orange peel, shredded seaweed. I served this delicious meal was served with a bottle of Dead Bolt™ White Winemakers Blend, the follow up wine to Pernod Ricard's wildly successful Dead Bolt Red Blend. The White Winemakers Blend is a full flavored, juicy blend lead by Chardonnay and featuring Chenin Blanc. As a Chardonnay lover, I really enjoyed this wine. It was fruity with a sweet spicy finish which paired excellent with the tuna. My Mom is not a Chardonnay drinker and I know she would love this as much as I did. This wine will accommodate many white wine drinkers palates. 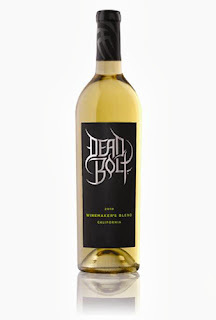 Expect to see Dead Bolt White Winemakers Blend on the shelves soon! Oh, so glad to hear you loved Tom Douglas' restaurants. I'm headed to Seattle in a few weeks myself, and I have reservations for Lola. I'll report back! OOOOH!!! We also went to Poppy which you would love. I did a separate review on a few restaurants. I cannot wait to hear where you eat. I love Seattle! Mmmm...maybe we could trade rubs for a meal? ;) I'm cooking with my Indian rub tonight..used the salmon one last week and loved it. So glad we scooped them up. P.S> On a side note, I just realized you still have my old blog site up on your side bar...I was like...whatttt...it hasn't been that long since I last posted...then i realized!